Is it possible to create a healthy brownie? A regular brownie contains oodles of butter, sugar, eggs, and chocolate. They are a confection of MEGA calorific proportions and should be eaten as a treat. But, if you have a food processor, you can whip something up in minutes that tastes delicious. The key is to use healthy replacements for the butter, eggs, and sugar. In this recipe, which I created in my test kitchen (ahem, my kitchen), I used dates and almonds. Having a food processor in the house is extremely helpful. It cuts time on many cooking projects, such as making dough (pastry and pizza), grating cheese, and chopping nuts. To make these brownie balls vegan - use maple syrup or agave syrup. Add almonds to food processor and pulse until ground. Add dates, cocoa powder, honey, and water. Mix until it just forms a sticky mass. Wash hands and attempt to make a ball with the dough (it may need more water to get to the perfect consistency). Put a tablespoon of cocoa or confectioner's sugar on a plate. 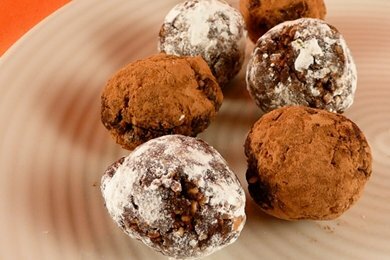 Roll balls in your hand and then roll in sugar or cocoa (or both). Eat! These can be store in the fridge for a week. These brownies look delicious and I love that they are low in calories. I like making brownies like these, but I process 1/2 cup walnuts, 1/2 cup dates, a pile of cinnamon, and 1/8 cup cacao powder. Sometimes I substitute 1/2 cup PB2 for the walnuts. These are SO much better than any other butter/white sugar brownie out there! Substitute Agave Syrup for the Honey to be vegan. Because Honey is not vegan. I just made these and they turned out a hit! hi, do you use those fresh dates (those Medjool ones) or just the semi dried ones that are packaged? One 9-inch pan, sprayed (or lightly greased) and lined. *Originally, this is already a low calorie dessert, and called for 1 C of sugar, but I did 1/2 C instead. It may be less sweet if 1/2 C is used. I like it just fine that way though. When I ran these No Bake Brownie Balls through my calorie calculator, it says that one ball is 112 calories, but when I had it serve 22 people, it said 77 calories. Hmm...weird, but I am still going to try these! !